Catoosa County Coroner Vanita Hullander has been involved with Teen Maze, an annual large-scale network of experiences to help teens see the potential consequences of making poor choices, for seven years. Last month, 1,500 sophomores from four counties attended the event at The Colonnade in Ringgold. One station in the maze invited students to post on a special wall things they would change about their lives if they could. "So many notes," says Hullander, "said 'I wish my parents wouldn't drink,' 'I wish there weren't drugs in my house,' 'I wish my parents would pay more attention to me,' and 'I'm thinking about suicide. Please help me.'" "We're facing a crisis today like we've never seen before," says Hullander, who has also worked as an EMT and in emergency rooms. "And children are suffering the most." "The reason God brings us into the world as babies is because there's someone bigger than us who should be guiding, teaching and correcting us." That someone is a parent says Hullander, and she believes that a large part of the crisis is parents who are steeped in substance abuse, addicted to their phones and devices or emotionally absent from parenting. But the problem is more complex than that, Hullander says. While parents are the ultimate people in their children's lives and the ones from whom children should be able learn how to live, there's plenty of blame to go around. "We promote destruction in our country now," says Hullander. "The national media is the greatest threat to our ability to heal. They are dismantling our country by sensationalizing everything and promoting confusion and despair. It's not profitable to the media for people to heal." Hullander says a classic warfare strategy is to divide people, then use the confusion to conquer. "The confusion maker has all the power." "No one knows what their roles are anymore. They don't know what their responsibilities are. Parents are afraid to correct their children. Legislatures are afraid to limit violent media and dangerous drugs. Everyone is walking on eggshells, afraid they'll do or say the wrong thing, so they do nothing. The people with the most to gain — financially or in the way of status or power — are the ones most likely to try to keep others confused and helpless." "We're three generations into this. For too many kids today, substance abuse, violence, broken relationships and irresponsibility are the new normal. It's all they know. It's what they see at home, online, on TV. They think it's supposed to be this way." "Children are starved for attention and guidance from their parents," says Hullander, "for a strong family life and adults who are part of the solution, not the problem." "When I worked in an emergency room," says Hullander, "fourteen and fifteen year old girls would come in miscarrying and heartbroken, because they desperately wanted that baby because they thought it would bring them the love they didn't get from their parents." On substance abuse, Hullander says, "Many parents introduce their kids to drugs and alcohol. In even more cases, parents and grandparents simply make drugs available to kids by keeping them where they're easily accessible. Parents today say, 'Go get me my Valium.' The kids know where it is, they get it and take some themselves. Their parents think nothing of taking drugs openly, so why should the kids?" Hullander is also concerned about prescribing drugs for children. "We need to stop labeling and medicating our children for acting like children. Kids have no choice. Adults can't be bothered helping them work through the normal challenges of growing up, so they drug them and the kids come to think that it's normal to take drugs to solve problems." On lawmakers: "Legislators like to talk about how concerned they are but they don't want to stick their necks on the chopping block for the good of society. They somehow think they've done their job by saying there's a problem. Too many of them bow to the drug industry or other special interests. Some just don't have a backbone. Some are blind to the dangers. Some think the answer is to lock more people up." "When you have a whole society that's dysfunctional," says Hullander, "incarceration is not the solution. Some people need to be in jail, but most need help. "They need laws that protect them and programs that help them recover and learn how to be functional, healthy members of society again." Hullander, who teaches substance abuse classes, would like to see prescription drug laws in Georgia like the ones in Tennessee that have rescheduled numerous drugs to more severe categories and strictly limit what drugs can be prescribed for and the duration of prescriptions. "We need to stop the addiction before it starts. Substance abuse destroys at so many levels — it sets the scene for ruined marriages, families and childhoods far into the future. It leaves people homeless, sick and hopeless. It hurts our economy and puts our freedom at risk. We can't run from this problem anymore." "We need to face the truth about why people become addicts," Hullander says. "No one wakes up one day and says "I want to be an addict.' Maybe they were abused or neglected as children or bullied at school. Maybe they've had no support system and see no purpose to their life. Addiction can become a purpose — it's always there, always calling to you. You have a family in other addicts and your dealer. It's a society unto itself. We must face the human need to belong, to have a purpose, and find ways to help those who have fallen into the destructive society of substance abuse. Locking people up will not solve the problem." Is there really a solution to all the dysfunction, both substance-induced and otherwise? Hullander admits it's a long road that will involve many people working together — schools, churches, social service agencies, courts, government and — a long shot — the media. But she returns again and again to what she considers most important: parents as examples, nurturers and authorities in their children's lives. "I'm not an expert on parenting," Hullander says, "but I do know what we're doing in this country is not working. I know that children desperately need their parents to step up to the plate and take responsibility and set limits and act like adults. And that's something that can start right now." "We need a lot of things — better laws, good rehabilitation, parenting classes, support systems. But there are thousands of children right here in our area who need their parents today. Parents may need help. That's okay — they should ask for it. There are plenty of us out here who are there for them. But children can't be put on hold while we try to get all this right and while we battle the forces that don't care if it's right. Kids need their parents today." "We need to become a nation of people who fix problems and help everyone learn to make better choices," says Hullander. "We have to take responsibility — all of us who can need to help those who are struggling — first, by not contributing to their problems and second, by offering solutions and healing." Dr. K. Daniel Phillips (sitting) and Dr. Paul Brock inspect an image at Floyd Medical Center. Drs. Paul Brock, K. Daniel Phillips and Steven Hom are experts in different branches of medicine, but when it came to the creation of The Breast Center at Floyd a decade ago, all three agreed something transformational had to be done to better diagnose and treat patients in northwest Georgia. "The delay of treatment for the women in our community was prevalent," said Dr. Brock, a general surgeon with Harbin Clinic. "The time between mammograms, diagnostics and treatment was as much as one or two months. That was unacceptable." Aimee Griffin, director of The Breast Center at Floyd, said they were seeing women with advanced stages of breast cancer whose survival rates would have been much higher had they been diagnosed earlier. Creating an environment where women could get an accurate diagnosis within 24 hours of having a mammogram seemed daunting at the time. Radiologists, pathologists and surgeons all had to be on the same page before The Breast Center at Floyd's Know in 24 promise could become a reality. "It was significant in that it required the different specialties to change the way they did things," said Dr. Phillips, a radiologist with Rome Radiology Group. "It reprioritized the importance of breast care and we had to trust one another. We were looking as a collaborative whole at what was in the best interest of the patient." He said the success of their efforts is visible and he credited Floyd Medical Center for its role. "Women know they can come to The Breast Center at Floyd and the will receive the highest level of care possible in a patient-centric way. None of this would have been possible if it wasn't for the administrative support of Floyd Medical Center." Dr. Hom, president of SouthEastern Pathology, P.C., agreed that working together resulted in what was best for the patient, a 24-hour turn-around time. "I can fully appreciate the anxiety produced in having to wait for a result, and reporting results this quickly is very gratifying to us," Dr. Hom added. "The major concern when we began this program was not sacrificing quality for a quick diagnosis and with the help of the histology departments at Floyd Medical Center and South-Eastern Pathology we can have the slides quickly including special stains." Griffin called the collaboration between Rome Radiology Group, Harbin Clinic and SouthEastern Pathology outstanding. "We have created a state-of-the art program where women in northwest Georgia have access to the most efficient, compassionate and highest quality care available," she said. The Mobile Mammography Coach has also played a huge role in reaching more women earlier. "It was critically important to us to realize there were certain women not getting screened because they were the primary breadwinners in their families and they worked in businesses and industries that did not allowed them to take time off," Dr. Brock said. "That mammogram machine now goes to industries throughout seven counties and we do mammograms for women who would probably not otherwise make it to a routine screening." • Susan Grout is a breast cancer survivor and her husband John is a business professor. Susan Grout's stress level would have been lower in 2001 if she didn't have to wait. She was diagnosed with breast cancer that year. It took three weeks and a second mammogram before she finally met with a surgeon to find out what would happen next. The following summer a lump was found in her other breast and she had to wait a week to find out it wasn't cancer. "That week," she said, "was longer than the three weeks because I knew what would happen if it was cancer." Seventeen years later, she can still recall the anxiety of not knowing. The staff at The Breast Center at Floyd pledges to make sure no one has to experience that feeling of living in limbo ever again. With its "Know in 24" promise, the center is celebrating its 10-year anniversary of delivering a quick and compassionate response to patients who get a mammogram. "I think from the minute you walk in the door it is a welcoming place. Those ladies at the desk are very friendly and helpful," Grout said. Susan Grout's husband, John Grout, is impressed with the Know in 24 promise and understands how difficult it is to make process changes work. He is a business professor at Berry College and is an expert in production and operations management. Grout also advises the quality committee of Floyd Medical Center's board. The willingness to absorb necessary labor costs and create work schedules that get the job done requires a commitment. Catoosa CFO Carl Henson discusses a new Trans-Aid agreement and liability insurance premiums during the Sept. 4 commission meeting. Catoosa County officials recently reached a new Trans-Aid contract agreement so that it can continue to offer rides to local senior citizens, as well as two other annual contracts. During the Sept. 4 Board of Commissioner's meeting, Chief Financial Officer Carl Henson explained the contract, and two other annual ones that the board unanimously approved. "The Transit Alliance contracts with the Department of Human Services to provide transportation for senior citizens to the county senior center," Henson said. "The estimated amount of trips exceeds 9,000 trips. The estimated value of the contract at $6 per passenger per trip is approximately $56,000." In addition to the Trans-Aid contract, Henson also presented to board with an annual audit engagement agreement between the county and Johnson, Hickey, and Murchison, P.C. "The amount of the contract is not to exceed $53,500, which is the same as last year," Henson said. Thirdly, the board signed off on paying a new premium for its liability and property equipment insurance with Liberty Mutual. "The current proposed renewal premium is $39,6505, which is up $7,644 over prior year," Henson said. Henson said that although this year's premium is higher than what was paid last year, the increase comes after huge savings were had when the county began getting its coverage from Liberty Mutual. "Up until last year, they had not been able to provide coverage to local governments in Georgia, but they seem to be very aggressive in this market," Henson said. "Last year, we had a reduction of $140,000 in the insurance renewal, and it's up 7,000 over last year's renewal." Henson presented the details of the insurance to the board, which includes increased property values. "In this proposal, they have increased the insurable values of property $15 million, and the value of personal property by $6 million, so we've had $21 million increase in estimated property values," Henson said. "This is their second year, so they spent this last year going around to all the buildings and reappraising with all the property. We've had a good experience with them this last year, they're real prompt on settling claims." Why is today's edition pink? Today's Catoosa County News has gone pink to recognize October as Breast Cancer Awareness Month. The pink paper honors those who have been touched by breast cancer. The colored newspaper also serves as a reminder from The Breast Center at Floyd, which is celebrating 10 years of educating and empowering cancer patients. Early detection is crucial to successfully treating those with breast cancer. 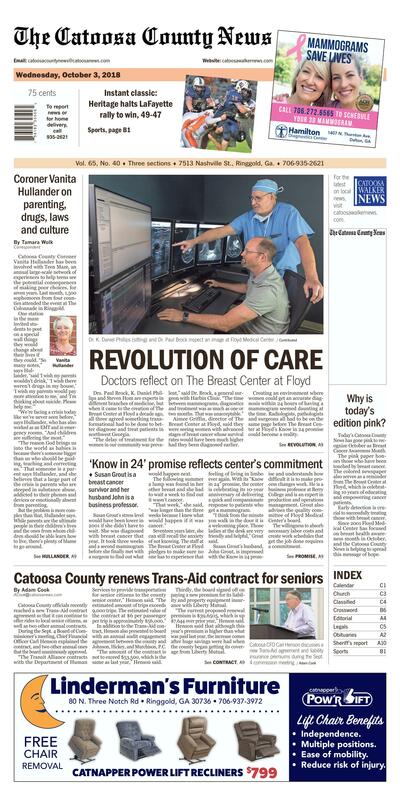 Since 2001 Floyd Medical Center has focused on breast health awareness month in October, and the Catoosa County News is helping to spread this message of hope.